Final Audio F7200 review | What Hi-Fi? Final Audio makes some bizarre earphones, a lot of which aren’t really made for western ears. The Final F7200 don’t suddenly hurtle into the mainstream. 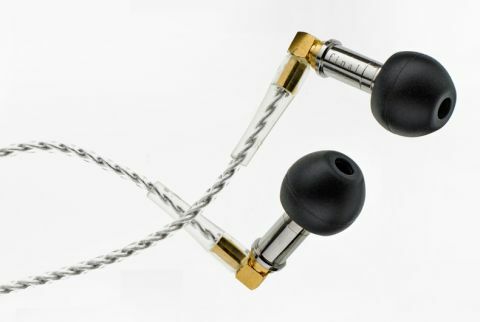 They are £400 earphones that appear to be made of miniaturised bits of plumber’s pipework. However, they don’t half sound good. Expensive earphones are often huge things that seem to want to fill your ears, largely because many of them use a whole array of drivers. The Final F7200 are among the smallest high-end pairs in the world, though. They use just a single balanced armature driver, designed to cover the whole frequency range rather than just the treble and mids, with which these units tend to excel. The drivers sit in tiny little pipes of diameters not more than a few millimetres wide. Getting the speaker units as close to your ears as possible is the idea. If you don’t like an invasive fit you may not get on well with the Final F7200s, but we had no issues with fit, comfort or stability: a pleasant surprise. The Final F7200s come with a mix of foam and silicone tips, but that’s hardly to be called generous when you’re paying this much. Each earpiece is made of two separate parts, both steel, and the section housing the driver separates from the cable using a MMCX connector. This makes replacing the cable possible, although as the included one uses silver-coated wire, you’ll want to keep that as safe as the driver parts. The cable’s sheath is a little harder than most and also prone to microphonic noise, but the F7200s come with ear hooks that trail the cable over your ears to dull any cable-on-clothing rustle. Other accessories include a carry case and “safe fit” rings. As the F7200s’ earpieces are so skinny you can pull tips over them much further than normal, and risk prodding you eardrums with the steel shell: ouch. These safe fit rings stop this from happening. To look at the Final F7200s you might think they are awkward and high-maintenance. However, they’re actually not. Pick the right tips and they’re surprisingly easy to fit. Isolation is very good too, again with the right tips. They deal surprisingly well with public transport noise for a set with very clean, light sound. The Final F7200s have no remote control housing, though, a clue that these earphones only really care about sound quality. They have no time for your phone calls. This focus pays off. The Final F7200s deliver exceptional detail across the entire frequency range, with beautifully clean treble and mids giving the pair a “reference” like quality. They reward close listening with high-quality files, acting like an audio microscope in a way that few pairs can even at the price. The use of a single driver helps to make the cohesion of treble and mids just about perfect. Vocals sound superb, the F7200s able to bring out fine mid-range texture like few others. It’s technically very impressive, but whether this is an earphone you’ll love or would be happy auditioning rather than owning will depend on your taste. The scale of the Final F7200s’ sound is modest. They can create crystalline soundscapes, but they are not epic. You therefore have to actively engage with the sound to get anywhere near a full appreciation of it. That’s not a big ask when the level of detail and great dynamics are so engaging, but worth considering if you’re after an everyday pair to use on your way to work. The one other weakness of the Final F7200s is predictable given they use a single tiny balanced armature driver. They struggle to present grand, powerful orchestral arrangements with the power of the best high-end multi-driver earphones, coming across a little polite and reserved. Some of you may be left wishing for a little more bass power too. The low-end is fast, taut and fairly deep, but these are not ear-rocking party headphones or a pair with cochlea-hugging warmth. Nor do they try to be. The F7200s are impressive, with stunning detail and clarity making them reference-grade in several respects. The potentially gimmicky ultra-slim construction does not hold them back. They lack some of the scale and power of the best at this money, such as the excellent AKG N40s but if you’re after an earphone that lets you dig deep into the tiniest crevices of high-quality recordings, the Final F7200 need to be on your must-audition list.